"One of the most unexpectedly enjoyable cinematic experiences of the year...there's a strong chance they've never looked or sounded better"
"The Most Immersive Concert Film Ever"
"Metallica gets the grand 3D opera they deserve"
"A full throttle expression of Rock & Roll anarchy"
"The apocalypse never sounded so good." SAN FRANCISCO - NOVEMBER 21, 2013 - Metallica today announced that their groundbreaking 3D feature film, Metallica Through The Never, directed by award-winning filmmaker Nimród Antal, will be released on DVD, Blu-ray, 3D Blu-ray, digitally, and V.O.D. (Video On Demand) on January 28, 2014 through Blackened Recordings. Formats will include a standard 2-disc package on DVD, Blu-ray, or 3D Blu-ray, as well as special expanded versions. 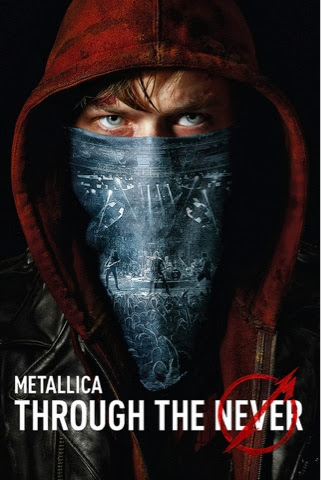 The DVDs and Blu-ray, 3D Blu-ray will include extensive behind-the-scenes footage from the making of the film, including an 80+ minute "Making Of 'Metallica Through The Never'" documentary, various interviews with the cast and crew and never before seen Metallica content. Metallica fans will also be able to purchase a limited-edition deluxe package containing a piece of the actual stage used in the film, a lithograph print autographed by all four band members and more. Full details of the package are below. The digital format will include the feature film, as well as the "Making Of 'Metallica Through The Never'" documentary. For more information on each DVD format, see below or visit www.metallica.com. The film will also be available for rental and download via V.O.D. on January 28 in the U.S., and at a later date (tbd) in Canada.